Oh my. I just finished a crazy quilting session that started with the sunrise and is just now ending at midnight (thanks for taking the kids all day, Steve!). Yeah, that would be my procrastination at work. 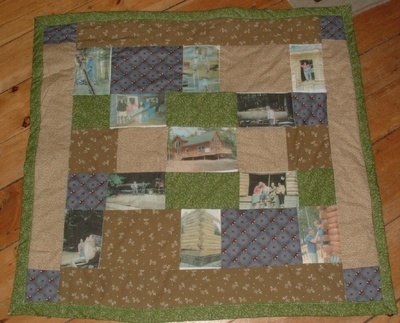 Today I started....and finished my parents wall hanging picture quilt for their30th anniversary, which we'll be celebrating this week. 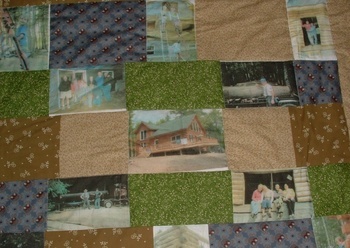 I used photos of friends and family building their new log home. I spent half the day battling with getting the damned photos onto the fabric using the Bubble Jet I got a few weeks ago. (And as a side note, after I finished the quilt, I realized you can BUY the fabric sheets--all pre-treated, and ready to go! Bah!). I used a cotton batting, and machined quilted it ("stitch in the ditch"--thanks for the tip, Amy!). There's lots that I would have done differently, but at this point, I'm just thrilled that it's DONE! It's hard to get motivated on a project that I don't love (ie. these fabrics are perfect for their log cabin and it's decor, but they certainly didn't hold my excitement, and my simple "design" is not so spectacular). Anyway...I think they'll be happy. And now I can move on to something much more fun! Whew!